Titanic has gone from being called the most expensive flop of all time to winning 11 Oscars ! See what all the fuss is about and visit the unique film set pictures in these pages. Steve Perez and Richard Seigle have both kindly allowed me to display their film set pictures of the reproduction, 775 foot Titanic made for James Cameron's film. The photographs are excellent, and show the set at Baja California, Mexico. The film set pictures from Richard Seigle are sold by him, and comprise 27 photographs taken by an extra on the movie. They are accompanied by a detailed description of each picture. Details of how to order them can be found on the page with his pictures. The film set interior pictures also taken by Steve Perez and Richard Seigle show shots of interior sets built for the film. Also, see below for Discovery Channel's actual shots from the interior of the Titanic now, and compare them with the film set. For cast details and other film information see The Internet Movie Database.Go to my links section at the end of this page to get the official Titanic film screen saver. A brief history of the R.M.S. Titanic, a collection of Titanic Web Sites, photographs of surviving Titanic memorials, and unique pictures from James Cameron's film set. 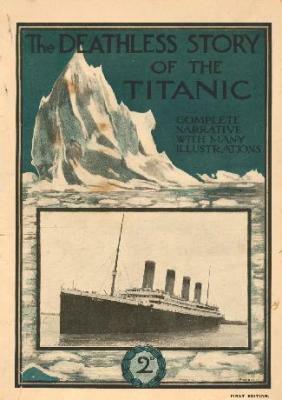 Now includes a Titanic Bibliography. 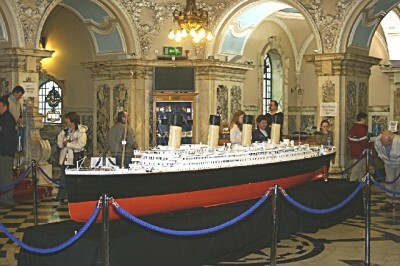 Don't miss the Titanic Memorials Page which includes up to date photographs of the Titanic Memorial Lighthouse in New York, pictures of the last White Star Line ship, the Nomadic in Paris, and photographs of actual wood panels and fittings from the Olympic, which now grace the Olympic Suite of the White Swan Hotel in Alnwick, England. Recent additions to this page include the Women's Memorial in Washington, and the Bandsmen's Memorial in Australia. The Royal Mail Ship Titanic. There are few people who have never heard the name, and don't know of her tragic end. The mystique surrounding this ship has endured for 85 years. White Star Line's most senior commander, Captain E.J. Smith, could scarcely have foreseen that he was sailing into history when he eased Titanic out of Southampton for the maiden voyage on Wednesday April 10th 1912. Just over five days later, at 2.20 am on Monday April the 15th 1912, Titanic disappeared under the Atlantic, just off the Grand Banks, not to be seen again by human eyes for another 73 years. That night 1500 people died. They ranged from the poorest working men and women, to the equivalent of the today's superstars. Top politicians, celebrities, millionaire entrepreneurs, and 200 ordinary families all perished. This was the human cost of the Titanic disaster. There are many reasons for the continued interest in Titanic: the stories of the passengers and crew; the fact that not a single life need have been lost if more lifeboats had been provided; the (some think) hubris of building an "unsinkable ship" (though neither White Star nor builders Harland and Wolff ever made that claim, but people often misquoted the Shipbuilder Magazine's "practically unsinkable" comment); the luxury and workmanship that the ship embodied; the fact that a nearby mystery vessel could have saved everyone on board but did not approach (the Californian/Captain Lord controversy continues to this day); the bravery and sheer professionalism of Captain Rostron who skilfully navigated the Cunard liner Carpathia through the deadly ice field at maximum speed to save more than 700 people by daybreak, and of course the discovery of the wreck itself by Dr Robert Ballard's team on Sunday September the 1st 1985. With the James Cameron Titanic film released in 1997, interest in Titanic peaked again, and the current touring Titanic Artifact Exhibit continues to draw large crowds. On May the 31st 1911 at the Harland and Wolff shipyard in Belfast, on the same day the Olympic completed her sea trials and was handed over to White Star Line, Titanic, with the help of twenty two tons of tallow, soap and oil, became the largest moveable, man-made object in the world. In keeping with White Star Line tradition, she was never christened, sliding into the River Lagan with surprisingly little wake, coming to rest in less than her own length. It had taken over two years from the laying down of the keel to the launch, and almost another year would pass before she emerged from the fitting-out basin as the most luxurious ship ever built. Titanic was equipped with four 400 kilowatt electrical generators, which meant that passengers could use electric lamps and heaters in their rooms. This was a luxury that very few of them would have in their own homes, and when we talk of the steerage passengers today, it must be remembered that their cabins and accommodation were exceptionally good for the time, as was their food. The gymnasium had an electric camel; electric lifts took passengers and crew between decks. The power was also used for the loading cranes, cooking in the galley, refrigerating the huge stores of fresh food down near the orlop deck, lighting and heating the public areas, the ventilation fans, operating the watertight doors, the telephone system and the Marconi 'wireless' equipment. Titanic's two radio operators manned a 5 kW rotary spark transmitter which, with the 4 wire antenna suspended 250 feet above sea level between the ship's masts, had a range of up to 400 miles during the day and up to 2000 miles at night. Many fascinating facts about the radio and its operators can be found at the Titanic Radio Page. The Titanic engineers were lost to a man whilst keeping the generators going, providing power for the lights and radio to help others escape, right up to within minutes of when she sank. The Titanic was originally meant to sail in March 1912, but the collision between the Olympic and the cruiser, Hawke, and the need to repair the hull and replace one of the Olympic's propellor shafts delayed the completion of the Titanic because Harland and Wolff had to carry out the repairs. Titanic began her maiden voyage at noon on April the 10th, 1912. Even that date had been in doubt, because a coal strike meant that the White Star line had to appropriate coal from other ships to use on Titanic. Perhaps the rush for fuel contributed to the spontaneous coal fire that started in number 10 bunker, boiler room 6. The whole Titanic story seems to be strewn with "what if .." scenarios. There are many links along the "causality chain" which, if broken, might have saved the ship. Though it was registered in Liverpool, Titanic began her maiden voyage from Southampton on that Wednesday Spring morning. As a result of the recently ended coal strike, much of her fuel had been taken from other White Star ships, whose passengers had been transferred to Titanic at no extra cost. Many of the passengers had taken the Boat Train from London's Waterloo station, down to Southampton, no doubt looking forward to being the first paying passengers on the grandest ship afloat. From Southampton, Titanic crossed to Cherbourg, France, and anchored a mile offshore so that the purpose-built tenders Nomadic and Traffic could bring more passengers on board, Cherbourg not having a pier large enough for the Olympic class liners. That evening Cherbourg was left behind as the ship headed for its next, and as it turned out, final port of call. By lunchtime on April 11th, Titanic was anchored off Queenstown (now known by its former name of Cobh) in Ireland. Fortunately for history and himself, it was here that Father Francis Brown, the Jesuit priest, got off the ship, taking his camera with him. The Odell family had similar good fortune, and from their album comes the picture seen in many books, simply captioned "The last known photograph of the Titanic". That same afternoon, Titanic weighed anchor, steamed along the coast of Ireland and on out into the Atlantic, with Captain Smith's blue ensign on the rear flagpole, the White Star flag on the main mast, and the stars and stripes of her intended destination, New York, U.S.A., fluttering on the foremast. Want to know more ? Follow some of the links below, or see my recommended books in the Titanic Bibliography. Steve Perez of Abilene, Texas, and Richard Seigle of California have asked me me to display their film set pictures from James Cameron's Titanic. Steve and Richard have copyright on their respective sets of pictures, so please don't mail me asking for copies. This "11 Oscar" film stars Kate Winslet as 1st class passenger Rose, who is reluctantly engaged to be married to the extremely wealthy Cal, played by Billy Zane. However, as they travel back to America aboard Titanic, she meets 3rd class passenger, free-spirit and penniless artist Jack (Leo DiCaprio), and begins to fall in love with him. The story is told by the 100 year old Rose, who is brought in to help a modern day treasure hunter find a fabulous diamond, "The Heart of the Ocean", last worn by Rose on the night of the sinking. Will love conquer all ? Well you'll have to go and see the film or get the video or DVD to find out! Titanic was released on December 19th 1997 in the U.S.A., and on January 23rd 1998 in the U.K. . Having been to see it twice now, I would say it is well worth seeing if you are interested in the Titanic. The recreations of the ship are tremendously detailed. Try the Internet Movie Database for more details including a full cast list. Before leaving this site, have a look at the pictures on my Titanic Memorials Page, the second page of film set pictures, and send your comments. Let me know which pages in particular you have visited. Please note: I am not James Cameron, did not appear in the film, and had no part in the production of it.